No posts the last week or so, aside from my previously scheduled beer post. I actually got to a pretty interesting point – I have no more posts in the queue. I’ve been dwindling on that front for a while, and had basically been less than 5 for a month or so. And then I went to Mexico for my buddy’s wedding with just 2 posts in queue. One was a completed insert set, the other was yesterday’s “beer” post. But yesterday was the last “scheduled” post that I’d done in advance. 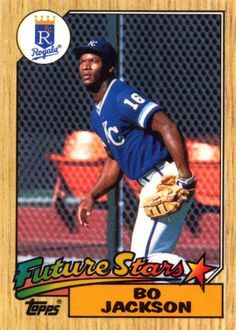 So for the foreseeable future, this blog will be at the whim of my schedule and desire to do baseball card posts. I’ve picked up other hobbies, and with 2 kids, it’s just harder. I want to get the Lifetime Topps project done, but I may need to rethink the insert part of that. It’s just become too much by the time I got to the mid 2000’s. I’m kind of happy about that. Blogging takes up a lot of time, and I’d like to just do it when I get the urge. At least for now. I think I’ll still knock out 10 posts a month or so. We’ll see. That aside, I have a few completed insert sets left, and this is one I’d be going after even if I wasn’t trying to get every insert Topps created. 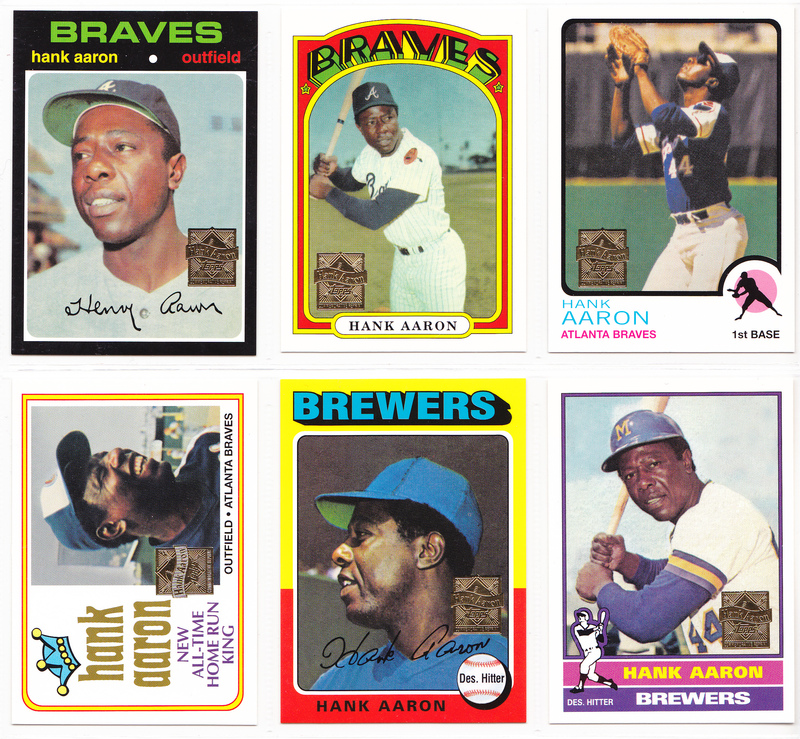 Set description: Aaron was the 5th historic player honored with a reprint set (Mantle in ’96, Mays in ’97, Clemente ’98, Ryan ’99). And he would be the last of this run; after 2000 they started doing multiple player reprints as insert sets. 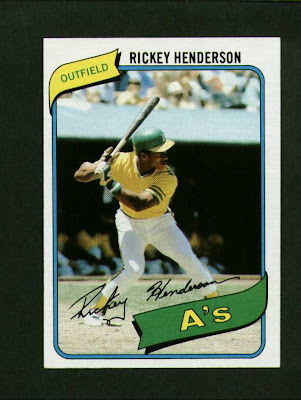 This set had reprints of the full run of his base Topps cards during his career. Reprints of his 19 regular cards from 1954-1976 were issued across both series. The 12 even years come in series 1, while the 11 odd years come in series 2. 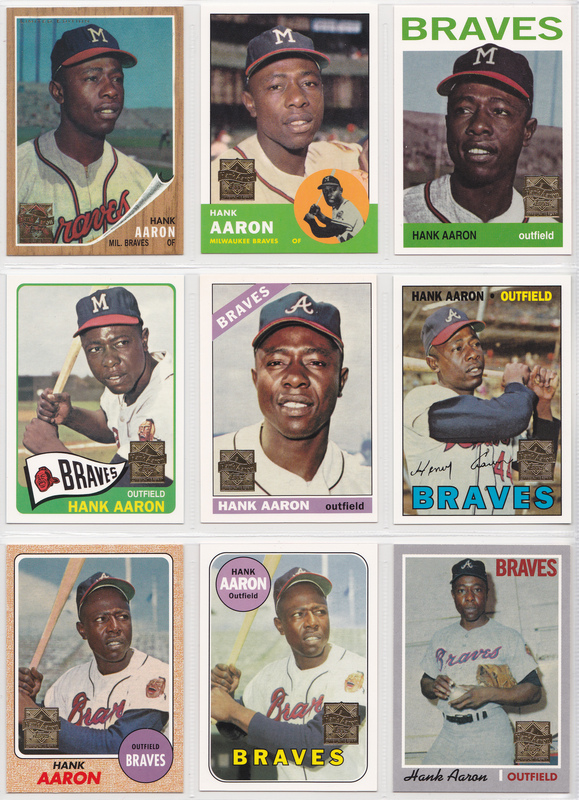 There is a gold Aaron logo, created just for this set. Hall of Famers: 1 – just Aaron. None of his multi-player cards are included. I bought the last card I needed from COMC back in July. I’d been one card shy for over a year, but this card, which is probably his most famous because of the reverse negative issue. That may be why it was the hardest to pick up. Thoughts on the set: Retro sets are everywhere you look these days, but in 1998 there weren’t that many, and they were almost all reprints. This wasn’t the first set like this, but it was still a great idea at this point in time. 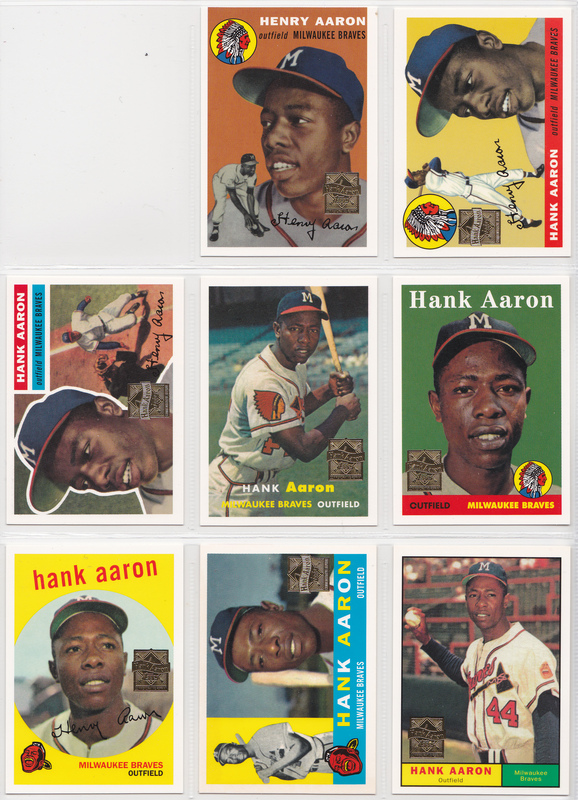 Aaron is one of those players who has an iconic rookie card. His 1954 Topps card has to be in any top 20 cards of all time, maybe top 10. So I’ve got to give the nod there. But I really like the 1973 card. My Favorite Reds card: There are none (obviously).